A Punch In the Gut that Went Straight To The Heart. I got a call over the weekend from an organization in which I was excited to have an opportunity to speak. It was a larger organization several hours away. She wasn’t calling to finalize plans for the event months in advance. Instead she was calling to tell me that there had been a mistake and she had to be the bearer of bad news that I was not the one the committee chose. It wasn’t her fault. She is new to the group and didn’t realize the process. Instead they had secured a speaker who has a national platform and had been featured in a national magazine. I swallowed hard and thanked her for calling because I knew it was hard for her. I’m not mad. These things happen and that’s how life rolls. I will admit however that I was very disappointed. And the devil stepped right in to use that disappointment. I started thinking maybe this calling I have wasn’t real. Maybe I didn’t hear God right back in 2000 at the women’s conference when He filled my heart with this dream to be an inspirational speaker. Maybe my goals are too big and I’ve done something wrong. Of course I’m not a national speaker and have never been featured in any magazine. I’m not good enough. Dreams don’t really come true for someone like me. I’m just a small town girl with a big time dream. God can’t use me. Just sit in your corner and write your blog and be happy where you are. That’s what the devil told me. I admit I cried a little. No. A lot. Again, I wasn’t mad. It was just a punch to my ego and a pop to my dream. I wallowed around in self-pity for a few days. I prayed. And cried. And prayed. And cried some more. Then I went to see the movie, “I Can Only Imagine”. That movie has so many emotions and story lines that can affect so many people in many different ways. But the scene that hit me hard was when Bart (of the singing group Mercy Me) decided he was going to quit the band because he didn’t get the first contract that came up. The devil was in his head telling him he wasn’t good enough even though God had given him this talent and this dream. But what he found out was that his mission all along may have been to witness to his abusive father through a song his dad heard him sing on the local church radio station. In the end it was his dad who found the Lord and ended up changing Bart’s life forever. And yes, you know how the story ends. He saw his dream come true. I’m not saying I will ever see my dream come true on any horizon like Mercy Me but I did pick myself back up from the wallowing in my own self-pity and realize that if my mission is in my own back yard, then I will do it and I will do it as well as I know how. God can use any of us and wants us to keep His dreams in our heart. Yes the disappointment punched me in the gut but it went straight to my heart where Jesus was waiting to remind me that no matter what I do, as long as it’s for Him, it is not wasted. I Corinthians 10:31(b) and 33 (b)- whatever you do, do it all for the glory of God. For I am not seeking my own good but the good of many, so that they may be saved. 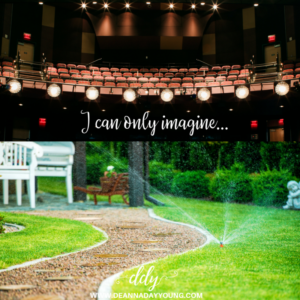 This entry was posted on March 26, 2018 with tags: #dreamscancometrue, #glorytoGod, #icanonlyimagine, #mercyme by Deanna Young.